It’s no secret that I love carbs. I don’t think I can ever give it up. Those diets that cut carbs – I probably would die. I can’t go a day without eating pasta, rice, or bread! I swear there’s not a better smell than walking by a bakery and smelling fresh bread coming out of the oven. I was reading this book, The Sharper Your Knife, The Less You Cry by Kathleen Finn last month (which by the way, if you have not read it, I highly suggest you do. It’s a really easy read and it takes you through her journey at the Le Cordon Bleu in Paris), and throughout the book, she talked about walking by all these patisseries and she’d describe the smell of fresh bread coming out of brick ovens. I want to experience that. It just sounds so heavenly and so rustic. 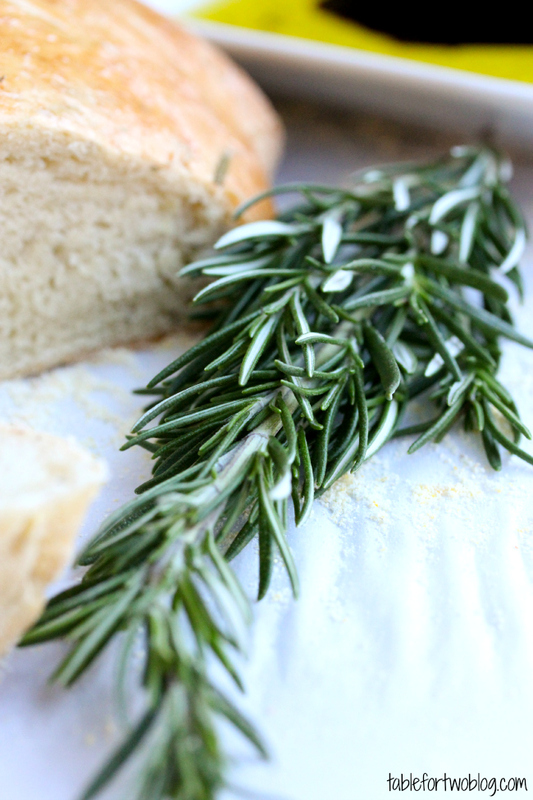 My favorite winter herb is rosemary, hands down. I love the smell of it. It’s so aromatic and smells medicinal to me sometimes. However, let’s not talk about the one time Jason and I killed an ENTIRE rosemary tree in less than a week. Yeah, these are pretty hearty herbs, we were clearly not born with green thumbs. 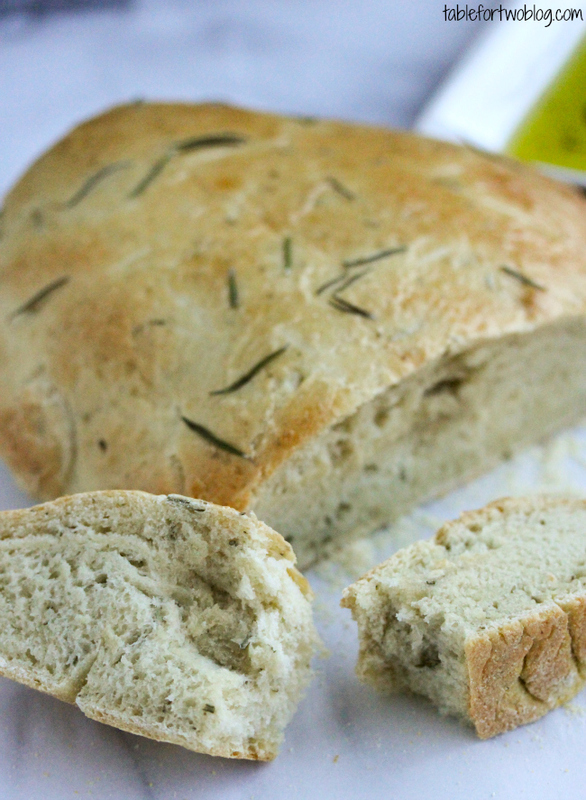 I love getting rosemary and olive oil bread fresh from bakeries. It just smells SO GOOD. I wanted MY house to smell that way and let me tell you – if you make this bread, you will want to live in your oven (ok, not reallllly). Anyway, make this this winter. It’s so fluffy on the inside and not a super hard crust on the outside. 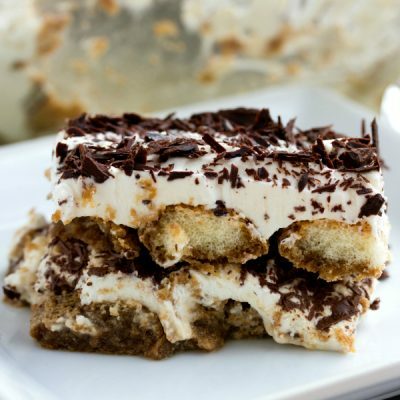 Dip it in some balsamic vinegar and olive oil and I’m pretty sure you’ll want to make a second batch of this. 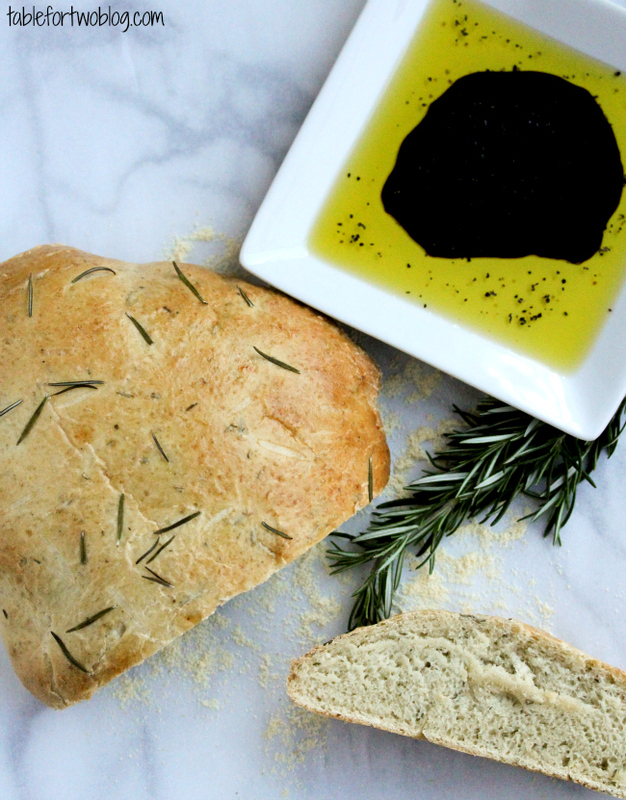 This rosemary olive oil bread is full of flavor! In the bowl of a stand mixer fitted with the dough hook, add flours, rosemary, Italian seasoning, and pepper. Mix to combine. Add in the yeast water and olive oil and mix until dough starts to form and starts to pull away from the bowl. Knead for 5 minutes with the dough hook. 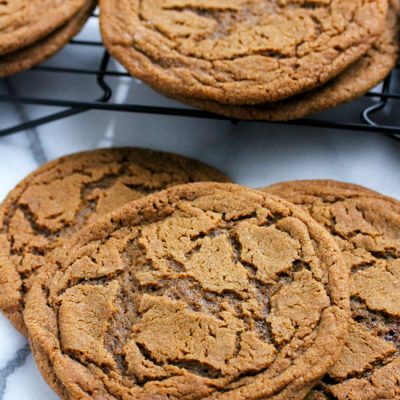 If it feels too sticky, add a bit of flour to it, a tablespoon at a time. Once it's been kneaded, place dough in a lightly greased bowl and place in a warm, draft-free place, and let rise for 1 hour. After dough has risen and doubled in size, punch it down and form it into a round loaf. Using a pizza pan (or pizza peel, whatever you have), dust with cornmeal and place loaf on top. Cover and let rise for another 45 minutes. In the meantime, put a pizza stone in the oven and preheat to 400 degrees. Carefully slide the dough onto the pizza stone (it should slide off very easily with the cornmeal underneath it) and bake for 20-25 minutes until the top is nicely browned and there's a hollow sound when tapped. I highly suggest investing in a pizza stone. It makes all your breads (and pizzas) have that bakery style crispy bottom crust. It's just so much better to have that crunch! Hey, Julie! 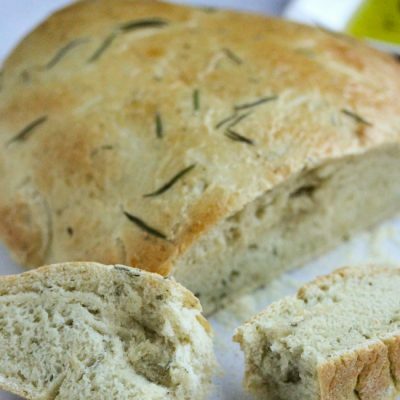 :) I made this bread tonight, and it was good, except that it seemed rather bland, except for the rosemary. I noticed there was no salt listed in the recipe, so I didn’t add any, but we could really notice the omission of salt when we tasted the bread. Would it adversely affect how the bread turns out if I added some salt next time? Hi Carly, thanks for your feedback. I will modify the recipe and add in an addition of salt. The bread was very tasty, but the ratio of flour to liquid seems way off. With 2 cups flour and one cup water/yeast, it made flour soup, so we wound up using closer to 4 cups flour. That’s interesting that you would use so much flour in the 2:1 flour to water ratio. Others have made it fine with what I wrote but as long as it worked for you, I’m happy :) Thanks for the comment! I had the same experience as Gb plus I thought it needed a touch of salt. Today I made it again with 1/2 tsp salt and 1/4 cup more bread flour. Everyone raved about the texture and flavor with your original recipe though, so they thought I didn’t need to tweek it. Thanks for the great recipe. This is delicious. I plan to possibly try making this bread. I never grew up eating sugar in our bread-More Europeans don’t normally add sugar in their breads. But since this one is a little different-rosemary in there etc. Wondering if I will need to add the sugar, would it taste noticeably different? Also, how much salt would you add in the recipe too? Thank you. 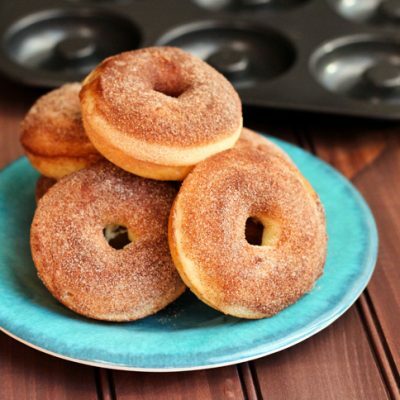 You definitely need to add the sugar because it helps the yeast proof. Salt, I would say start with 1 teaspoon kosher salt. Thank you for your reply & help! Can’t wait to make this!! You probably could, I have never tried it that way though so I can’t guarantee results! Go ahead & use all purpose flour & add some vital wheat gluten. Sold by “BOB’S MILL” available in most grocery stores & some food coops. Also, if you have a bread machine use it to make the dough. Shape, rise & bake in the oven. Yummy! What temp do I cook it in? It says in step 6. 400 degrees. I don’t have a pizza stone, what else could I use ? You could turn a baking sheet upside down in the oven while it warms up. I’ve seen people do that instead of a baking stone. Made this recipe yesterday. I loved how it looked and the texture and taste. Also the ease of making. I finished making the first loaf and decided to make a second right after but just added an egg wash on top so that sea salt would stick on top. Also I kept the rest of the recipe exact except I made mine in my Dutch oven for 20 minutes st 480 degrees. I will be making this often. Thank you!